I started work on a new pair of jeans today. While I still love the first pair I made, and pretty much wear them every day, there are a couple of areas where I can improve the fit. The waste on my first pair is too big, and the fit through the leg is a little baggier than I prefer. Even though these were fairly minor changes to make on my pattern, I still want to make a muslin version before cutting into my denim stash. You never know how a few small changes in one place will alter the fit somewhere else. The other reason I want to make a muslin version is that I just got a new industrial sewing machine, which is really, really fast, and I can use the practice to learn the new machine. The seams below puckered a little bit, which is probably a result of the tension being set too high and the heavy duty feed dogs that are on the machine. Once I switch to denim, the puckering shouldn’t be an issue. I attached the yokes and back pockets today, and hope to start work on the fly and fronts this week. 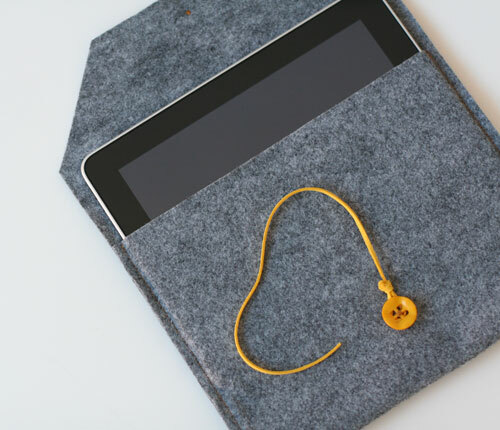 My wife and I threw together this felt iPad sleeve to protect the new toy from scratches and our crazy cats. The felt is far too thin for this to be a long term solution, but it works just fine for now. 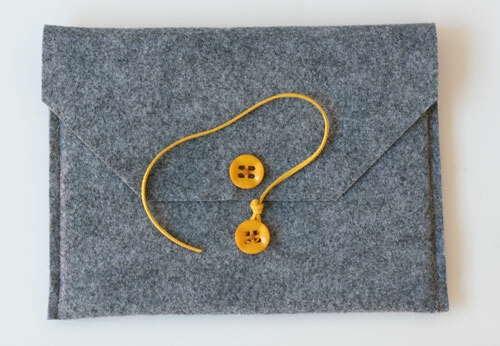 Ultimately I would like to make a similar case out of 3mm 100% wool felt, but that stuff is a bit pricey at $70 + per yard. For $70 I would rather buy a bunch of selvedge denim for more jeans! When this case finally dies, I might have to make a lined, selvedge denim case for the iPad. 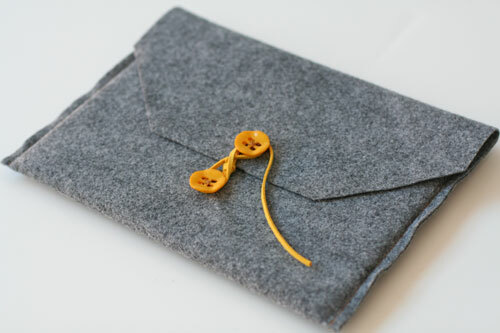 I still have some denim left over from the jeans I made, which would be perfect for this type of project. Clearly Roy’s Jeans are quite awesome, but more than anything, I have major sewing machine envy. I love the way these vintage machines keep running after years and years of use, and in some cases, they are actually preferred to new machines that perform the same tasks. Roy’s Jeans – Video by Self Edge from Self Edge on Vimeo. A few weeks ago I finally finished the three shirts I started at the beginning of September. Considering that I bought some of this fabric back in June, these shirts took much longer to make than I anticipated. But having never made a shirt from scratch before, I didn’t really know what to expect. I basically followed the same procedure I used to make my jeans earlier this year. 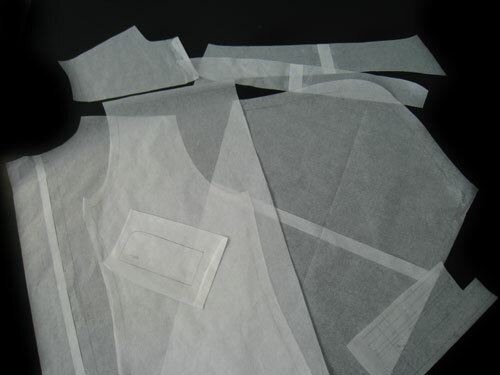 First, I drafted a basic upper body pattern to establish the general fit. 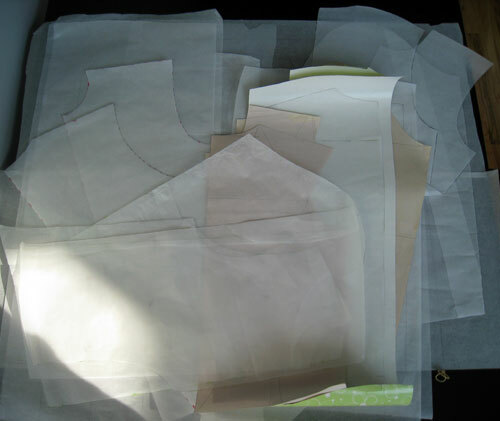 Once I had an upper body sloper that fit really well, I modified it to create my shirt pattern, adding the yoke, sleeves, plackets, cuffs, collar stand, collar, and pockets. 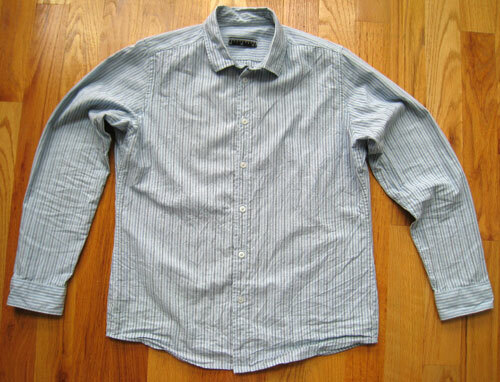 The stripes in this shirt are various shades of blue. I decided to leave the pockets off of this one for a little variety. 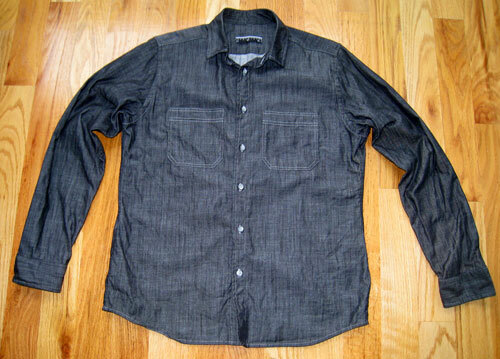 This is a dark charcoal (almost black) chambray with pockets. I love the way this fabric feels, but I’m not completely sold on the color. I don’t usually wear shirts quite this dark. I am thrilled with the way these turned out. The fit is nearly perfect, which is somewhat slim but not “fashiony” tight. I designed the shirt tails to be a little shallower and a bit shorter than usual to give me the option of wearing them untucked. 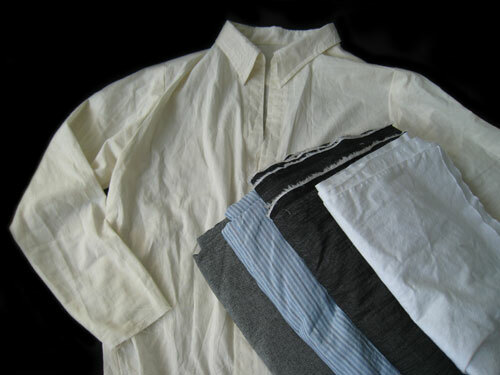 There are no pleats or gathers on the yoke or at the cuffs, which I think gives the shirts a cleaner look. While the process was long and tedious at times, it was also very satisfying to start with a blank sheet of paper, (okay maybe more than one sheet) and turn it into the perfect handcrafted shirt. I wasn’t thrilled with the way the collar turned out on my muslin test shirt so I went back to the drawing board before beginning to work with nicer fabric. The collar pattern I used on the test shirt had what I thought were really steep points that were too close together. I redesigned the collar to have a more “square” shape, which also resulted in the points being spread further apart. 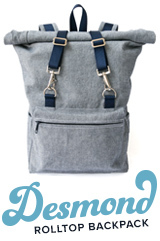 Below is the new collar shape and collar stand cut out and prepped in the charcoal chambray shown in my last post. 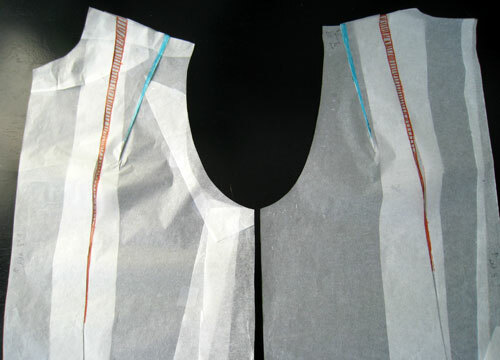 The white pieces you see are bleached cotton interfacing that has been glue basted to the top collar and top collar stand. Constructing the collar is definitely one of the harder tasks when making shirts. Each step requires precision, careful measurement, and attention to detail. 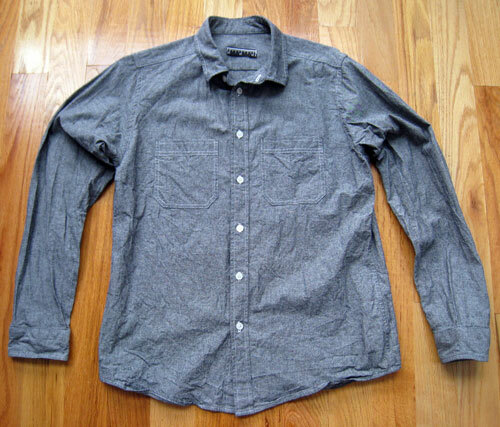 I sewed three or four practice collars before I actually cut into the chambray shown above. 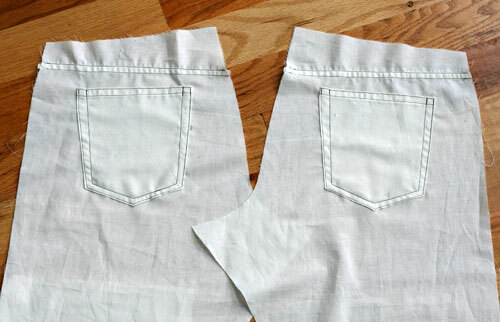 Alright…back to the sewing machine! The majority of my men’s shirt pattern is finished. Yay! I ran into quite a few snags during the drafting process, and this pattern took much longer than my jeans pattern to get right. I am still tweaking the shape of the collar a bit, and I need to determine the shape and length of the shirt tails, but thankfully the tough parts are over. 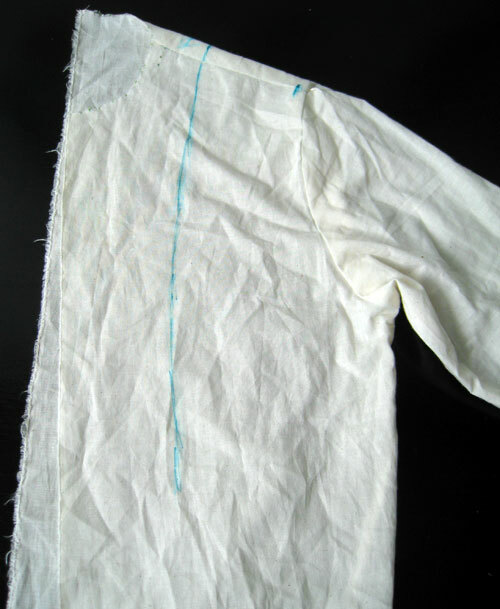 After finishing my sloper and the main pattern pieces, I made a quick muslin version of the shirt to test the fit. I didn’t attach cuffs, plackets, or buttons because I just wanted to make sure that the main body of the shirt fit properly. For the most part I was really happy with the way this test shirt turned out. There is a little extra room throughout my lower torso area below my chest and arms, which will be corrected by curving the side seams inward. My neckline, collar, and collar stand all need to be taken in as well, but these should be fairly easy adjustments. Otherwise, I am almost ready to start on some “real” shirts. On top of my test shirt below are three different shirtings I plan to use: a gray chambray, a charcoal chambray, a blue striped fabric, and some interfacing. 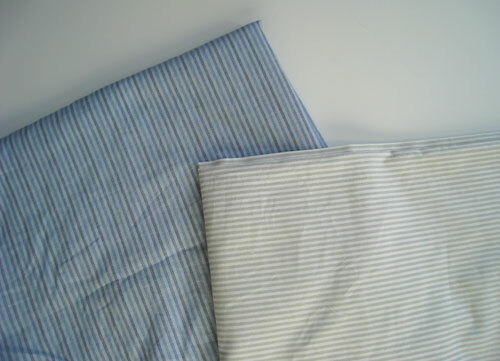 All of the fabric is 100% cotton, including the interfacing, which is actually bleached muslin. 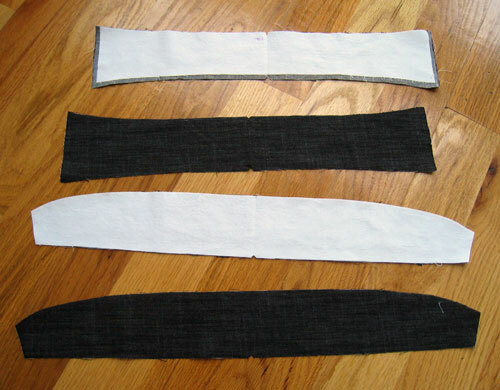 Based on David Page Coffin’s recommendation, I’ve decided to use sew-in interfacing for the collar, collar stand, and cuffs rather than fusible interfacing. Throughout this entire shirt making process, I have been using Coffin’s Shirtmaking book. I would highly recommend this book to anyone interested in learning great construction and fitting techniques. He provides step-by-step, detailed instructions for the most difficult tasks such as constructing and attaching collars, collar bands, and cuffs. I can’t wait to get started making some shirts that I might actually wear! So I finally finished my men’s shirt sloper by adding the necessary ease across the upper back and chest area. I am going for a somewhat slim fit with this shirt, but let’s face it, I still need to be able to move and breath with some comfort. To determine where I needed the extra room in the sloper, I tried on the version below for my totally awesome pattern drafting/sewing teacher. She drew vertical blue lines in the areas that were too tight. 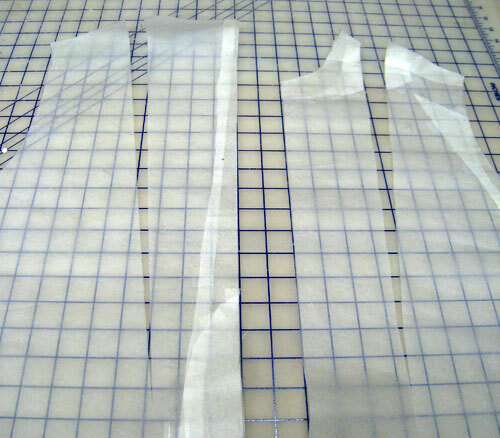 From here, I carefully matched up my pattern to the muslin test sloper, and then transferred the blue lines to my pattern paper. 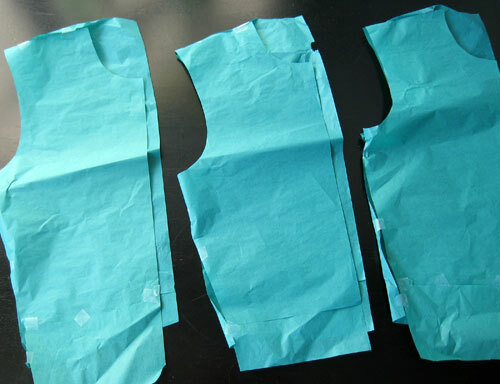 To add the ease to the pattern, I cut along these lines and spread open the front and back pattern pieces as seen below. I inserted some scrap paper underneath the cuts in the open area, and attached these pieces with tape. Below are the final front and back to the shirt sloper. The orange area is where I added ease across the chest and back. One consequence of spreading the sloper at the shoulder seam was that this created a shoulder seam that was too long. To fix this problem, I folded out the extra length along the seam, which I marked with blue in the photo below. Now that the sloper is finished, I can begin tweaking it to design my shirt pattern. Um…yeah…that’s a lot of paper. During the past few weeks I have accumulated this mass of paper in my attempt to draft a men’s shirt sloper. I have drawn, adjusted, and redrawn this pattern too many times to count. Compared to my jeans sloper, which came together relatively quickly, this shirt sloper is taking quite a bit longer than I expected. I started with the same book I used for my jeans, The Practical Guide to Patternmaking for Fashion Designers: Menswear by Lori A. Knowles. This taught me the basic shapes for the front piece, back piece, and sleeve, but I had some fit issues with this initial pattern. Trying to draw a pattern on a flat piece of paper that allows for the way the arm moves relative to the body is more complicated than I previously thought. I started making some changes on my own, and while I got somewhat close to what I was looking for, the sloper still wasn’t perfect and certainly wasn’t ready for me to use to begin making shirt patterns. Instead of continuing with blind trial and error, I decided to save some paper (and my sanity) and got some help from a wonderful sewing/pattern making teacher here in Nashville. She was able to help me with some of my fit issues and as a result, I finally have an upper body sloper that fits really well. I still need to add a bit of ease across the chest and shoulders in the back, but for the most part I am almost finished with the shirt sloper. I ended up with three or four different variations. 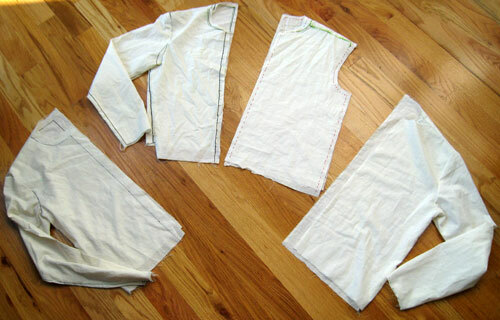 I tested the fit of the front and back in tissue prior to cutting out the pieces in muslin. Tissue is not the best way to gauge whether the pieces fit correctly, but I wanted to see if they were roughly the correct shape. Once I determined that I was on the right track with the tissue test fit, I cut out each version of the pattern in muslin to give me an idea of how the sloper would fit using fabric. This also gave me a chance to see how the sleeve interacted with the front and back pieces. Each version was progressively better than the previous version. Since I wasn’t sure how the pattern would fit, I only cut out half of the sloper each time I tested it. As soon as I add some ease to the latest version, I will test the whole upper body at the same time, which is really the only way to make sure the sloper fits exactly how I want it to. The best motivation for me to start a new project is to go out and buy the fabric. After I’ve already spent money on some yardage, I am more likely to take the time to start working on the pattern. I ordered the denim for my jeans months before I was ready to cut into it, and have already ordered more to use towards the end of the summer. Now that I have my jeans pattern more or less finished, I am turning my attention to the next most obvious wardrobe staple, shirts. When I saw that my local fabric store, Textile Fabrics, was having a 50% off sale on all of their fabrics, it was a perfect opportunity to stock up on some shirt-making motivation. I started preliminary work on an upper body sloper, which includes a front, back, and sleeve. As soon as I finish the sloper and test fit it, I can begin designing the shirt pattern. My goal is to create simple yet versatile, slim-fit shirts. With some minor adjustments, I should be able to use the same pattern for both dress as well as more casual shirts. 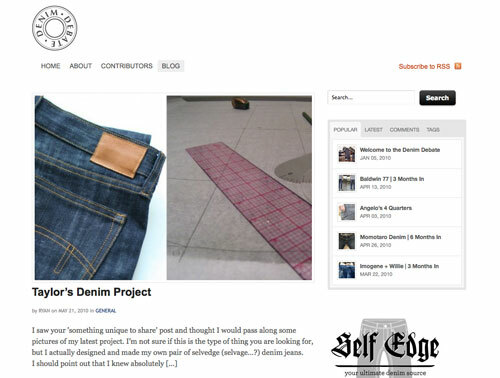 I want to give a huge thanks to Ryan at the Denim Debate for posting about my denim project. The Denim Debate is a fantastic resource for exploring great denim brands and is a must read for denim enthusiasts. Ryan put out the call for anyone with something unique to share to submit photos and information about their project to his blog. I was thrilled when he said that he would like to post about my custom jeans! It is always great to connect with like minded people who are as passionate about denim as I am.